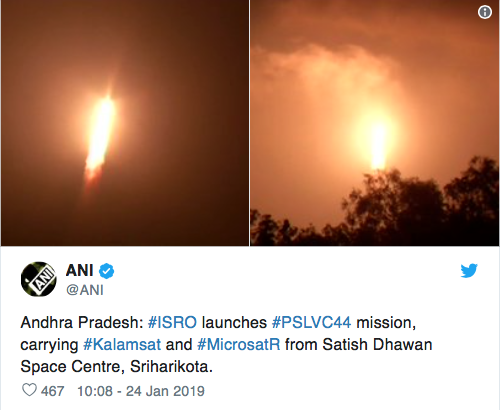 SRIHARIKOTA: India successfully launched Microsat-R, a military satellite onboard its Polar rocket PSLV C44, from the spaceport here on Thursday, in the first mission for the ISRO in 2019. The fourth stage of the rocket with co-passenger Kalamsat, a students' payload, would now be moved to a higher circular orbit, around 450 kms from earth, so as to establish an orbital platform for carrying out experiments. Kalamsat is named after former President Abdul Kalam. The Indian Space Research Organisation's (ISRO) workhorse Polar Satellite Launch Vehicle (PSLV) blasted off from the first launch pad of the Satish Dhawan Space Centre at 11.37 pm at the end of a 28-hour countdown. In a textbook launch, the 44-metre tall, four-stage PSLV-C44 soared into the clear and starry night sky majestically and injected the 740-kg Microsat-R into orbit precisely 13 minutes and 30 seconds later. ISRO scientists broke into celebration at the mission control centre here, about 130 km from Chennai, as the Microsat-R was released in a 274-km polar sun-synchronous orbit, marking another success story for the space agency. Former ISRO chairmen Krishnaswamy Kasturirangan and AS Kiran Kumar were among those who witnessed the launch. The ISRO said it would take about 90 minutes for the fourth stage to reach the desired orbit. Microsat-R, an imaging satellite, is meant for military purposes, but the ISRO did not give any details about it. The PSLV C44 is the first launch for the country's space agency in 2019. The PSLV-C44, assembled in 30 days, was the first mission of a new variant of the PSLV, called the PSLV-DL, as it was equipped with two strap-on configurations, the ISRO said. Usually, PSLVs were launched without any strap-ons (boosters) or were equipped with six strap-ons fixed around the rocket, but the ISRO, for the first time, used only two boosters for the mission, an official of the space agency said. He added that for the first time, the ISRO placed a satellite -- Microsat-R -- in a lower orbit, at around 274 kms from earth. Built at a cost of around Rs 12 lakh, the Kalamsat is an experimental miniaturized satellite for studying the communication system of nano satellites, which can be useful in many fields, predominantly disaster management. Contributed by college students and the members of a Chennai-based organisation -- Space Kidz India -- Kalamsat is the first to use PS4 (the fourth stage of the vehicle) as a platform to orbit around the earth. "We have been working on the project for over six years now. These students are from various backgrounds and the youngest one is studying B.Sc Physics," Space Kidz India CEO Srimathy Kesan told PTI. Kesan said Kalamsat was the lightest ever satellite to be launched by India. Space Kidz India aims to nurture young scientists. With this, the PSLV, basically a four-stage vehicle with alternating solid and liquid stages, has launched 54 Indian and 269 satellites of international customers.